I’ve been moving some boxes around recently and I unpacked the bandpass filters I built for one of the Martello Tower Group DXpeditions and successfully used again during our activation of the MV Ross Revenge in August 2016. It struck me that I’d never produced a full set of figures showing rejection on each band, insertion loss and SWR for them so today I’ve corrected that. My filters were designed by Bob Henderson, 5B4AGN who helps set up group purchases once a year of so of all the parts required to build them. Everything is done through a Yahoo Group so if you’re interested, head over there to find out more. Although I bought all the parts to build six filters, I didn’t make the one for 160m so I have a set of five filters for 80m, 40m, 20m, 15m and 10m. Without these filters it wouldn’t have been possible for us to have three stations running simultaneously while on Herm and two stations sitting next to each other on the Ross Revenge. To measure the performance of these filters I used my miniVNA PRO and my homebrew dummy load. Even though the filters aren’t designed for rejection specifically on the WARC bands, I measured them on those bands as well for completeness. I believe that Bob has produced some newer design filters with higher rejection since I built these and they cope much better with the WARC bands. For each filter, I connected it to the VNA and measured the rejection per band along with the insertion loss on the primary band. I then disconnected one side of the filter, connected it to my dummy load and measured the SWR. The important frequencies are the multiples of the primaries so for 80m we’re mainly interested in 40m, 20m and perhaps 10m. For 40m, we’re interested in 20m, 15m and 10m etc. 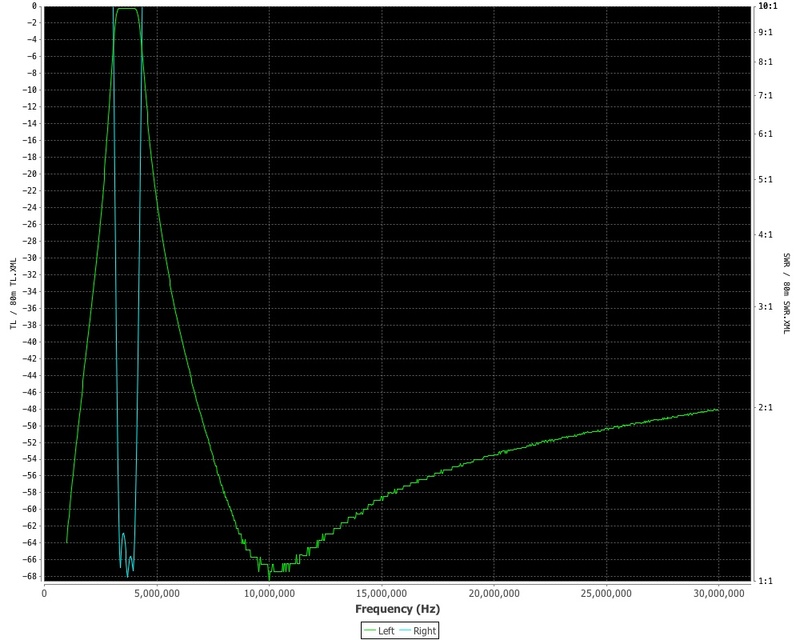 The ‘next-door’ bands and the WARC band aren’t really important so it’s no surprise to see that the 20m filter only gives 14dB of rejection on 17m or the 10m filter only gives 10dB of rejection on 12m. It’s interesting to see that compared to the very popular Dunestar filters, the 5B4AGN TXBPF are superior in performance overall and at a much cheaper cost. I seem to remember these worked out at about £40 each to build. Of note is the exceptionally good insertion loss figures on these filters, varying from 0.19dB to just 0.31dB which compares very favourably with all the commercial filters I’ve seen. Apart from the chart, I also plotted rejection/insertion loss against SWR for each filter. Each image can be clicked to see a higher resolution version. I built these as individual filters in their own boxes rather than having them all together and switchable for the simple reason that for a multi radio station, if the filters had been all boxed together then I would have had to build two or perhaps three sets at the additional cost and time. I never expect to have two or more stations operating on the same band so therefore one set of filters is enough. The rejection figures really do talk for themselves and once you’ve used bandpass filters on multi-station setups, you won’t want to operate without them. If you run any kind of special event station, DXpedition or contest where you have multiple stations running, I really can’t recommend enough that you have a set of bandpass filters to hand. There are a few different types of commercial filters with different levels of performance but it’s a great feeling to have built your own which perform better than the majority of commercial products at a cheaper price. This entry was posted in Amateur radio, Construction, DXpedition, HF and tagged 5B4AGN, 5B4AGN bandpass filters, Bandpass Filters. Bookmark the permalink.